ERA BS Rim Locks, one of the better known security locks. For the ERA BS Rim Locks, North London Locksmiths Ltd. shop is the answer, selling all types of these Locks as well as our Carpenters and Locksmiths fitting them. Being an agent, for this Company, we can get any lock in there range for you. 020 8800 6041 to speak to a member of our friendly Locksmith team. TRY OUR LOCK FITTING DEPARTMENT, WE WILL ALWAYS GIVE A FAIR AND REASONABLE ESTIMATE. Our aim on our North London Locksmiths Ltd. SHOP SALES is to give the best Priced Locks which we possible can. Being an established Company for more than 35 years, we can be relied on to deliver the goods for you. 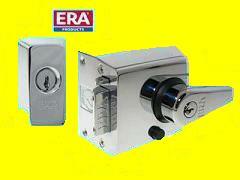 The ERA Double Locking British Standard High Security Nightlatch. Ideally suited to glass panelled wooden doors. It’s designed with an internal lockable handle, offering added security against forced entry. Operation is by key from the outside and by a handle from the inside. Available in Polished Chrome, Satin Chrome and Brass. The ERA BS Rim Locks High Security Nightlatch features an integral cylinder pull which protects the cylinder from being drilled. The cylinder also has well over 30,000 cut key variations. The Nightlatch also comes with a 20mm bolt throw for greater security and strength. This product is ideally suited for glass panelled wooden doors, as it has been designed with an ergonomic internal lockable handle offering added security against forced entry. The main lock bolt “automatically” deadlocks, this makes the use of a credit card to force entry virtually impossible. The bolt can also be held in the withdrawn position (only) with the use of the snib feature. The BS High Security Nightlatch conforms to British Standard 3621:2004 (BS EN 12209), and meets the tough criteria laid down by the insurance companies and the Police. The ERA British Standard High Security Escape Nightlatch now gives customers an even wider range to choose from. It complies with BS3621: 2007 and falls in line with the new European Standard (BS EN 12209), offering added security against forced entry. 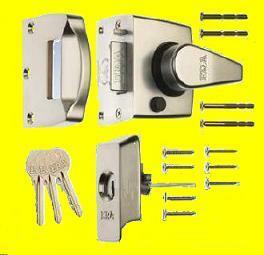 The ERA BS latch can be mastered or passed with other locks. THE ERA COMMUNAL OR FIRE ESCAPE BRITISH STANDARD HIGH SECURITY NIGHT LATCH 1730 SERIES. These ERA BS Rim Locks Night latches have the same features as the above lock, but are ideal for Communal doors or Fire Exit doors, where easy exit is a must. This lock cannot be locked from the inside. It is key operated from the outside and is a very secure lock. The ERA 1730-31 Rim Lock is an ideal Communal Door Lock, with its dead latching action, it cannot be slipped from the outside, and conforms to BS 8621:2004 standards. This lock can be matered and passed to keys with the same section. The Number "ONE" North London Locksmith Company for ERA BS Rim Locks. If you cannot find a lock you are looking for, on our WEB SHOP please fill in the form giving as much detail of lock as possible, we will respond with a discounted price, for that lock, as soon as possible.